But when we are little, our color choices are very narrowed to a much simpler pallet, and it’s difficult now to imagine how very many possible associations attach themselves to each of those archetypal hues. Even as children, our choice of favorite color is a complicated one, though its complexity may not be very evident to our young minds. Our experiences shape our choices, and our experiences are most certainly influenced by the opinions of others. Different societies and cultures affect their members’ psychology and, thus, their associations with various hues. It is a popular topic (as I’m sure you are aware). 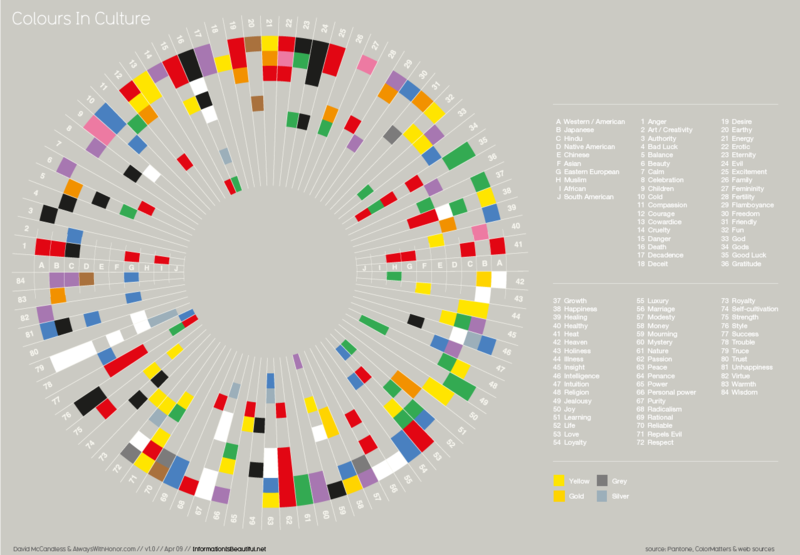 But here is a delightfully different and succinct take on the psychology of color: its variations between cultures. Designed by David McCandless (a London-based author, writer and designer) and Always With Honor (a design company based in Portland, Oregon). Other categories stand out because the color associations were the same. Passion, for example, is red, and Purity is white (and a little silver). Could one draw any conclusions from the presence/lack of color choice about the category’s position in the culture? Does its lack of color association point to a peoples’ stance on that category, its importance in their lives or how embedded it is in their worldviews? Does this chart show us that no one category has a universal color associated with it? The chart only shows one color for each…is the color association discounted if it was actually boiled down to two hues? What myths or symbols or histories gave birth to these various associations? How, if at all, did one culture’s color choices affect those of another culture? Oh–and where did the designers find this data?? Anyway, it’s a neat infographic! If you want to buy it poster-style, click here!